There's sweat dripping from my forehead and I can feel it down my back as well. I picked the wrong day to wear a jumper and jeans to test out a VR boxing experience. 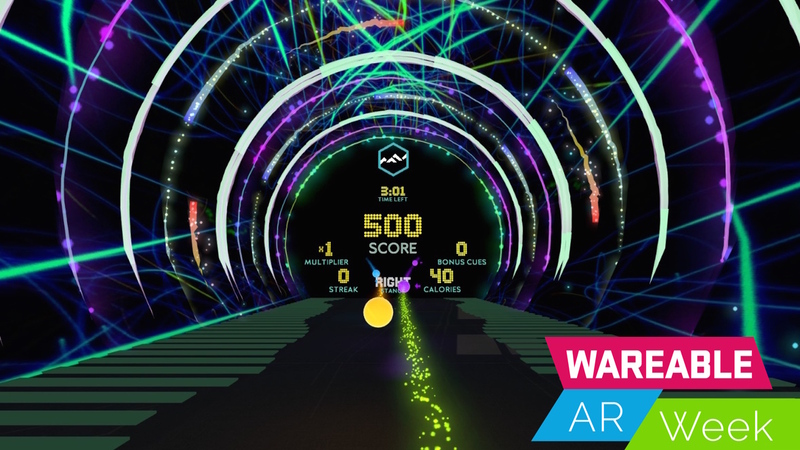 Sam Cole, co-founder at FITAR, a virtual reality and augmented reality studio has invited me to try out BOXVR, currently available in beta via Steam Early Access for the HTC Vive, with plans to bring it to other platforms including PlayStation VR. I'd describe BOXVR as a cross between Guitar Hero and Moov's boxing workouts. There's HIIT class-style music playing in the background as I'm handed a pair of Vive controllers, which need to be turned slightly on their sides and transform into a pair of virtual boxing gloves. After the warm up where I learn how to jab, upper cut and hook, I'm thrown into workout mode. Through the six minute power session there's spheres flying at me that I need to attack with the correct punch style and objects I need to jump over and duck down not so subtly introducing squats into the fitness equation. The Vive headset does have a habit of moving around as I make my way through the session, but I feel like I achieved what Cole and co-founder Sameer Baroova hoped to achieve and that was getting a proper workout in virtual reality. With Baroova's experience developing games at PopCap and Electronic Arts and Cole's interest in VR, the two came together and explored the idea of working on immersive fitness projects. After prototyping experiences for cycling, boxing and dance, they settled on boxing as it felt like a really sound product according to Cole and worked surprisingly well in VR. "When we looked at what was happening with developers in this space, often games developers are producing games and tagging on fitness," Cole told us. "I think they are coming from it at the wrong angle. We say, let's take best practice from the fitness industry and let's find ways to gamify that to make it accessible. The immersive aspect is to try and increase the level of motivation and make fitness easier and more enjoyable." Since the £14.99 VR game launched on Steam three weeks ago, it's been downloaded 250 times and while Cole acknowledges that launching on Valve's storefront might not be the best place for its key target market and its vision, it has been surprised by the response and the engagement from the Steam community. "Our target market is anyone that has gone to a group fitness class or hasn't but would like to. That might be because it's too expensive, not accessible or from fear of embarrassment of going to a class," he said. "The community are coming back to tell us how much they enjoyed the workouts so it validates what we are doing." Cole also appreciates that while the VR market is in its early days there's still many challenges that FITAR and other studios face to make virtual reality more accessible. He does believe big changes are coming over the coming six to eight months that will have a huge bearing on taking it mainstream. While the studio has been working with Vive and Oculus so far, it has also been dabbling in PSVR and smartphone VR. Once the team is able to grow, Cole believes standalone headsets from the likes of HTC will prove vital and could lead to VR hardware being bundled with software. "What's really interesting is being able to sell a software and hardware combo," he said. "We look at someone like Peloton as a really powerful case study. They've got a bike that costs $3,000 and you also have to pay for a monthly subscription. It shows from a consumer point of view, there's an acceptance to spend a reasonable amount of money on fitness equipment. VR is waiting for this move beyond gaming. You're going to see more folks from fitness and other spaces looking at this space." FITAR's attention is firmly focused on VR fitness right now, but it initially set its sights on AR and mixed reality first, believing it would be a better fit for creating immersive fitness experiences. Cole explained that it keeps close tabs on companies like Magic Leap and Microsoft. AR remains the ultimate vision, but it's still a bit far away. "You've got the potential of the lightweight headsets, it's not entirely immersive, so you are still in touch with your surroundings. We still believe it will revolutionise fitness," he told us. "Once we dug a lot deeper into the technology, we like many other companies are using VR as a gateway into AR. The AR tech and headsets are less mature than VR." So what's the problem with bringing AR and fitness closer together? "The biggest limitation with the AR headsets is you have the ones like Google Glass where you've got a heads up display and that's it. That feels more like a different form of a 2D screen. It does have merits but you don't get the same immersion." "Then you've got the true AR/MR headsets from the likes of Microsoft, Magic Leap - whatever that will look like, and the likes of ODG," he added. "The limitations there is that they are clunky, have to be tethered and the field of view. For us, the field of view is something that needs to improve before we can really get into that space. When you're outside of that field of view on something like HoloLens, you lose that sense of immersion. For a fitness product, I think it is the future but that's something that needs to be overcome. That and adequate hand tracking." That hand tracking is something that the team is trying to address with the current version of the fitness experience. Right now, you have to use the Vive controllers, but it's not the perfect setup that the studio envisaged. It's one of the aspects it's already working on to remedy. "We've been working with a VR glove manufacturer to design VR boxing gloves," Cole told us. "That for us is the first step for a number of things. Some of our initial designs are for an open palm boxing glove, the kind you'd see if you walked into a 1Rebel boxing class. There will be vibration pads on the front so you can feel the impact, full tracking and we are also thinking about doing weight inserts. So if you had a different type of workout, you could slip in 1kg weights." With BOXVR still in beta, other changes are afoot. The studio is looking at the possibility of letting users add their own music so that workouts can be generated based on the tempo of the music. The team would also love the idea of bringing biometric data tracking into the mix, envisaging a setup similar to the Orange Theory fitness centres that are starting to take off. It also has its eyes set on fitness outside of the comfort of your home and getting them into gyms. "We spoke to Virgin Active quite a long time ago, right at the start of the process," Cole told us. "The two things we need to worry about is the product needs to be sound and then there's hygiene and durability. Our concerns are not so much on the durability but on the hygiene issues and sweating in the headsets. "What we are seeing with these VR arcades is that some of these concerns around sharing VR is easy to overcome. We are doing workouts that are 7-8 minutes long and can go up to 25 minutes long. It hasn't been a bigger hurdle than we initially thought. We have spoken to Third Space, for them, it's if they find the right space and can hide the wires away it's more possible." FITAR is also looking at life beyond VR boxing. What's next? Dancing, that's what. "We are very excited about a dance fitness game," Cole said. "The elements of the current game lend itself well to this. For it to be robust, we need leg tracking though. It still amazes me that Zumba managed to sell so many with the game on the Wii where they were just tracking from the hip." Will that dance game happen in VR or AR? Only time will tell.